Happy anniversary to me! I've been blogging at Storey for over a year now! I realized this because one of my first posts was about making dandelion wine on Mother’s Day. 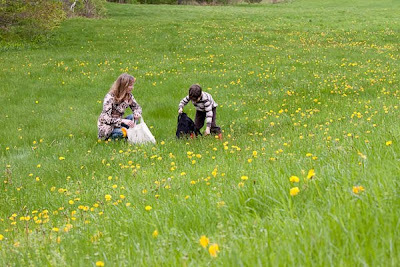 A year ago we picked dandelions to brew our own wine. 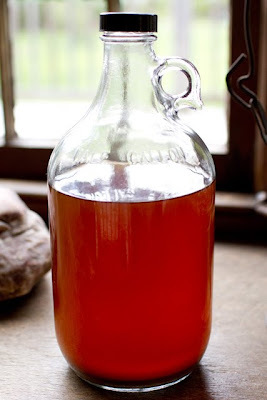 We had read that dandelion wine tastes best if you let it brew for a whole year, so we waited until this Mother’s Day to crack open our moonshine bottle. The wine turned out to be a rich amber color like a clear cider. We met my mom at the Remington Lodge for brunch and taste-tested our maiden effort. To my husband and me, it was sickly sweet, but we passed glasses around to friends and staff, and everyone else seemed to enjoy it. Carleen Madigan, the proprietor of the lodge, thought it tasted like port. My mom's husband Jeff likened it to ice wine. The consensus was that it was definitely a dessert wine, best consumed in small quantities. We shared it with another friend later, who diluted it in seltzer to make a wine cooler. I have to say I'm not likely to make a habit of brewing dandelion petals, but it was a fun experiment!